Posted on July 21, 2010	by Lou Murray, Ph.D.
Garden or blog, garden or blog? I’m afraid that gardening almost always wins out, which is why I’m only posting on Harvest Monday these days. Since the garden is producing nicely right now, that also means that I’m cooking a lot. This week’s menus have included a lot of nectarines. And since the hens are laying again, we’re also eating a lot of eggs. 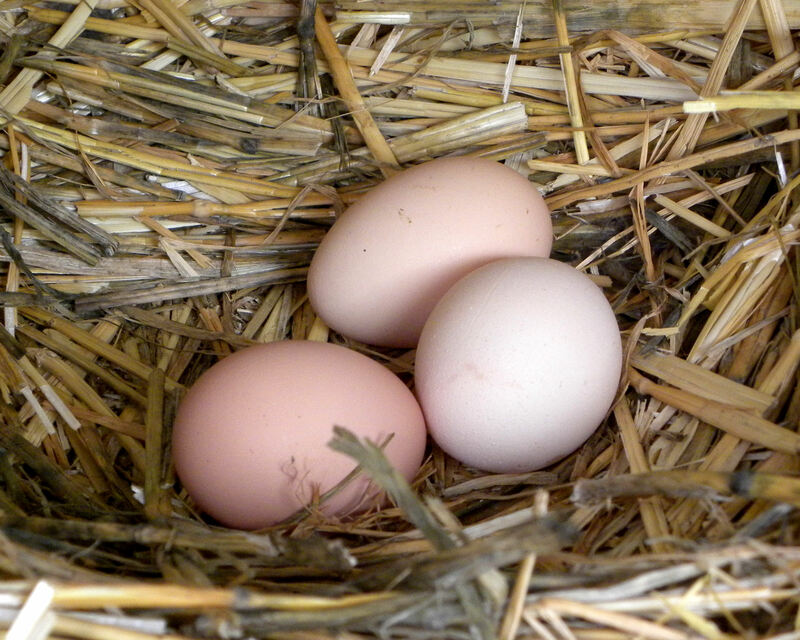 Now that the hens have finished their molt, we're back to three-egg days. 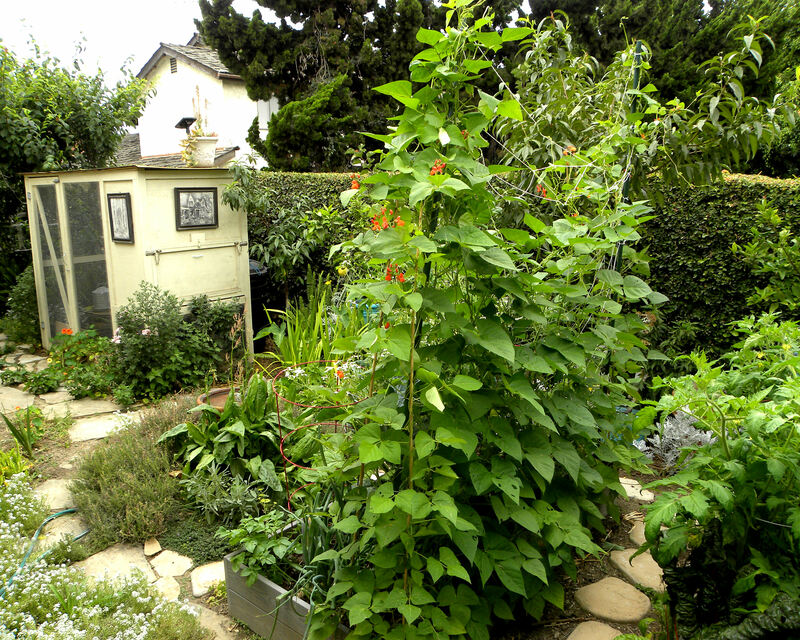 I’m also serving on two committees for the Huntington Beach Community Garden (fund-raising and operations), trying to get that non-profit off and running. We are so close to being able to get onto the property that I can almost see my new garden sprouting. Our plots (which are already all spoken for even though we haven’t even broken ground yet) will be 15 ft x 20 ft. Finally, I’ll have some real space in which to garden. I’m making do for now with three 3 ft x 6 ft beautiful raised beds in my back yard (see photo at top of page), a few Smart Pots in the driveway, and some languishing plants in the Garden of Perpetual Responsibility and the Garden of Infinite Neglect. 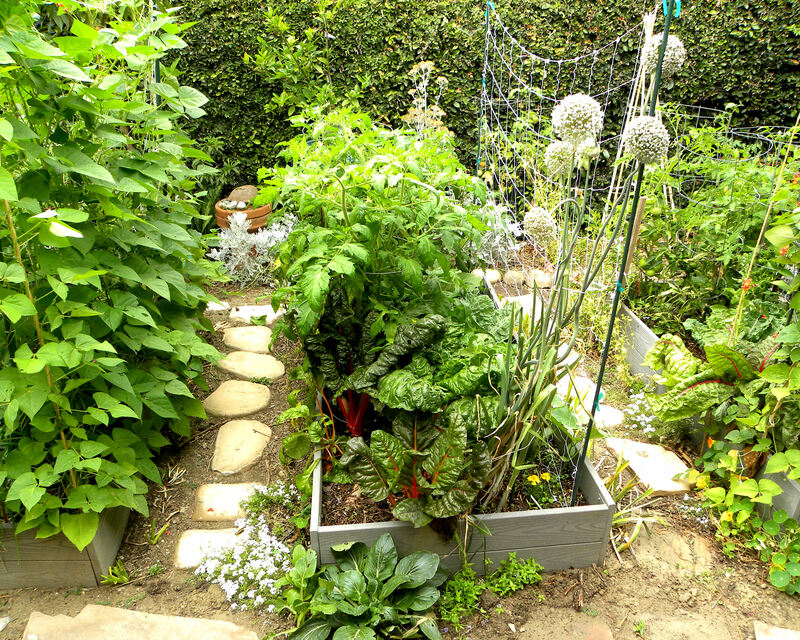 Despite extensive soil modification, neither of those two gardens produce very much. In contrast, my three Forever raised beds from Gardener’s Supply Company are the best gardening areas I’ve ever had. They are amazingly productive and easy to care for. Raised bed #1 has tomatoes, chard, garlic, bell peppers, a cabbage, a languishing yellow squash, and scarlet runner beans. Raised bed #2 has heirloom tomatoes, hybrid Kentucky Blue green beans, Summertop cucumbers, leeks, chard, Black Beauty eggplant, and savoy cabbage. Raised bed #3 has Scarlet Runner beans, Blue Lake pole beans, heirloom tomatoes, German white icicle radishes (going to seed), red onions, yellow onions, and purple broccoli. Some of my vegetables, like the radishes, leek, beets, and chard, are going to seed. I save the seeds of my heirloom vegetables (not hybrids) to grow the next year. Maybe some day I’ll stop buying new seeds. Yeah, right, fat chance of that ever happening. On to this week’s harvest. Subtotal 2 lbs, 13 oz. If you had a harvest this week, visit Daphne’s Dandelions and post a link so we can all enjoy your harvest vicariously. 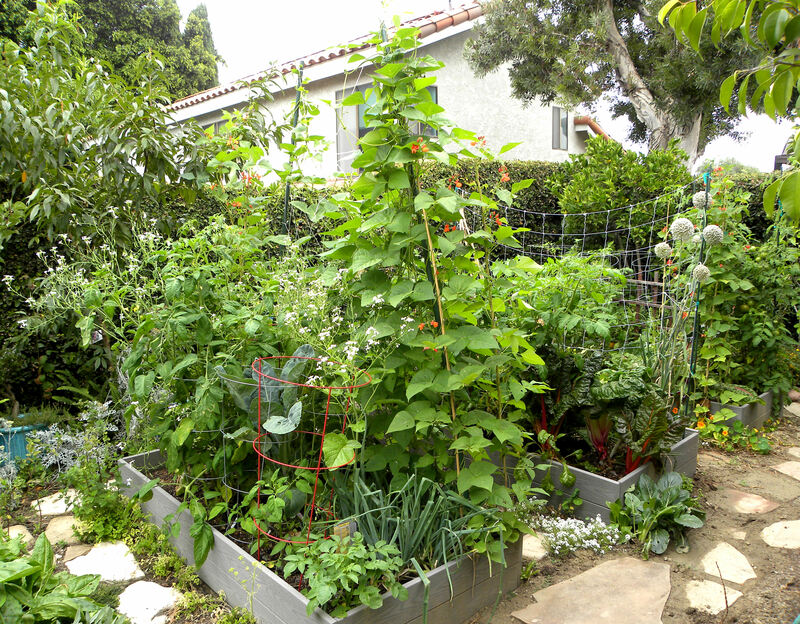 This entry was posted in Uncategorized and tagged Gardener's Supply Company, Harvest Monday, Huntington Beach Community Garden, photos, raised beds, vegetables. Bookmark the permalink. Mmmm…blueberries and nectarines, fabulous! 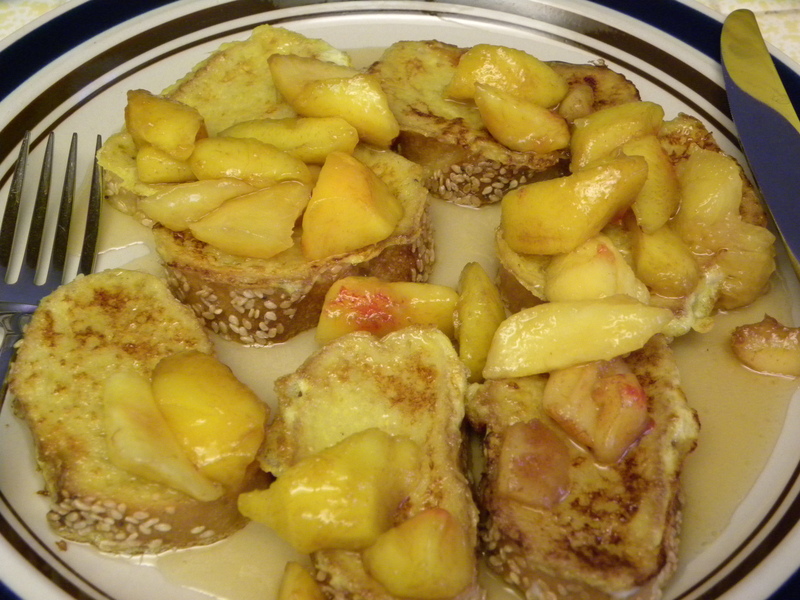 I made a white peach and blueberry cobbler for 4th of July, and your French toast reminded me of that. It looks wonderful. Glad to see your hens are laying again. I see you have a thing for scarlet runner beans too…ours have crawled off the top of the pole, and are now winding around each other for support. Hi Clare at Curbstone, I didn’t know you could cook with white peaches. I’m told that they don’t hold up to cooking as well as yellow peaches. Yeah, my scarlet runner beans are doing the same thing, trying to reach the heavens by clinging to each other. Gardening wins over bloging for me every time! I do take a lot of pictures in the garden, but just don’t have time to post it all. It must be very exciting to wait for new gardening plot. 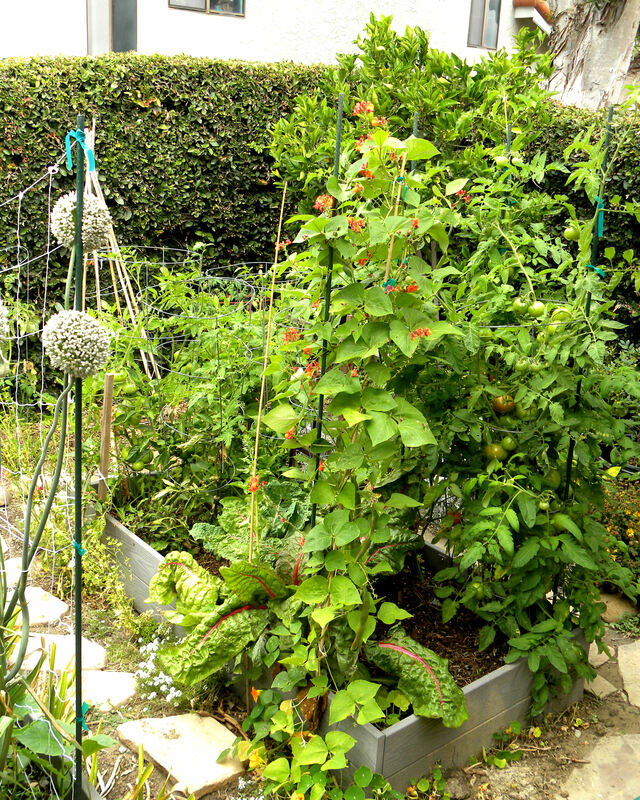 Hi, Vrtlaricaana, yes I can hardly wait to have some real space at the community garden. I’ve designed it and redesigned it in my head over and over. The summer garden plans are now moot because we’re still not on the property, so I’ll plan my winter garden instead. 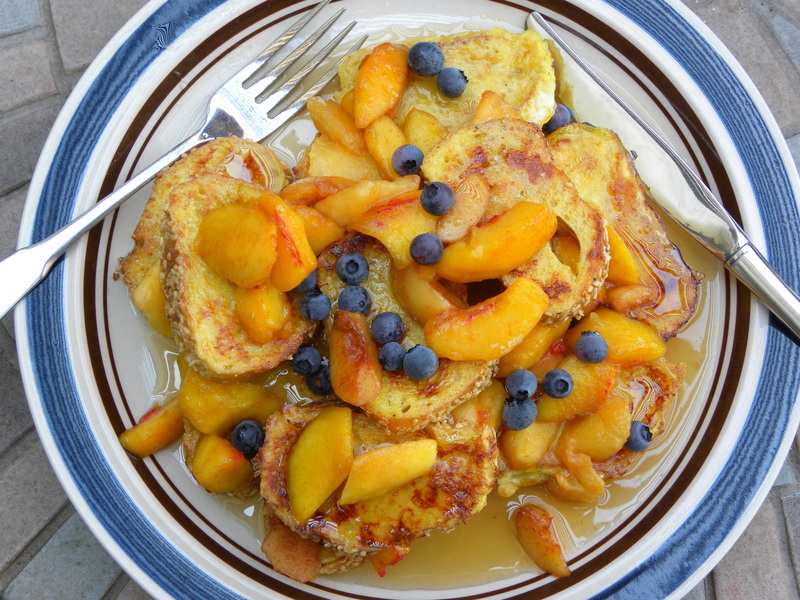 Your french toast with nectarines and blueberries make my mouth water. YUM! And your raised beds look very healthy! Late in visiting posts from Monday Harvest.